Uterus - Fibrosis in a female F344/N rat from a chronic study. Cystic endometrial hyperplasia (minimal) is also evident in this image. Uterus - Fibrosis in a female F344/N rat from a chronic study (higher magnification of Figure 1). 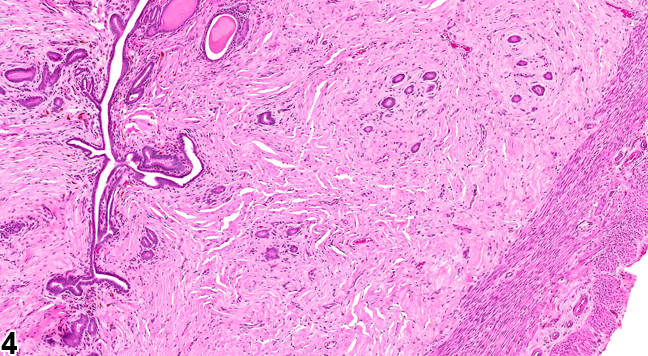 There is extensive collagen within the endometrium and minimal cystic endometrial hyperplasia. Uterus - Fibrosis in a female F344/N rat from a chronic study. There is fibrosis within the endometrium. Uterus - Fibrosis in a female F344/N rat from a chronic study (higher magnification of Figure 3). 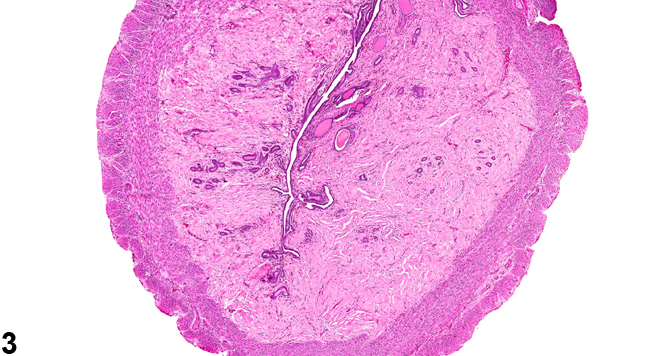 There is mature collagen within the endometrium. Fibrosis is the replacement of the stroma with mature collagen, fibrillar, eosinophilic material with few, interspersed cells ( Figure 1 , Figure 2 , Figure 3 , and Figure 4 ). Fibrosis (often minimal to mild) has been encountered spontaneously in the myometrium of older mice. In rats, stromal fibrosis and endometrial atrophy are also age-related changes. There is a progressive increase in fibrous connective tissue in the endometrium and the myometrium, resulting in a reduction in cellularity, which results in a hyalinization. Fibrosis has been induced in mice by exposure to zearalenone. 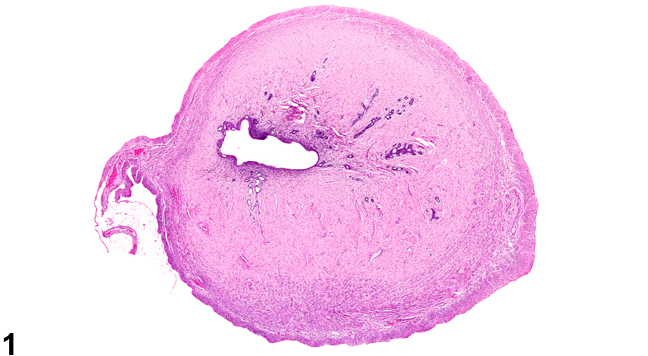 Fibrosis may also be a component of a chronic inflammatory lesion (e.g., metritis or pyometra). Uterus - Fibrosis should be diagnosed and graded whenever it occurs in the absence of other lesions. 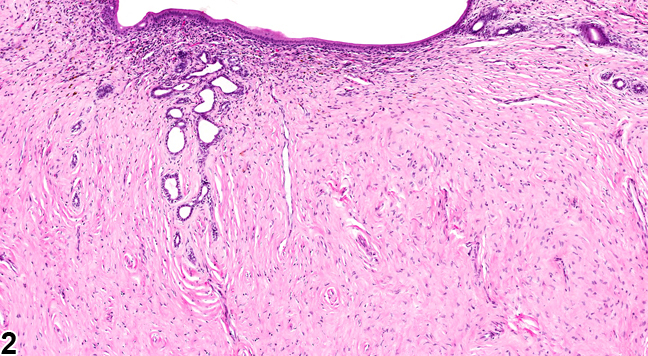 Fibrosis that is present as a component of an inflammatory lesion should be diagnosed only if it is a prominent component of that lesion or if the severity of the fibrosis is not commensurate with that of the inflammation (i.e., the fibrosis is more severe than would be expected given the severity of the inflammation). If fibrosis is not diagnosed separately, it should be described in the pathology narrative. When diagnosed, the severity grade should be based on the extent of the lesion..